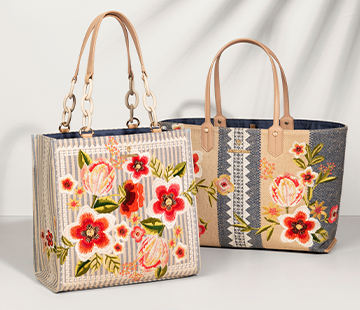 Every Spartina product comes with a story, a company tradition dating back to our very first collection of our signature linen and leather handbags. When choosing names for each season's linen patterns, we draw from Daufuskie Island's lush natural environment and rich cultural heritage. 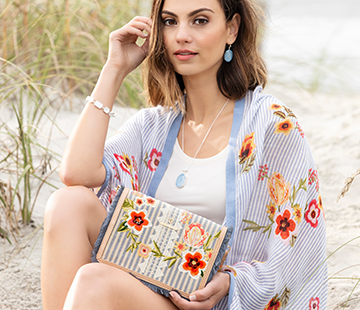 Click the swatches below and enjoy these stories about the people, places, and historical events that have supplied the inspiration for Spartina 449, season after season. Along Hilton Head’s serene Broad Creek is a Lowcountry oasis of dolphins, abundant fish, crab, oysters and willowy marsh grasses. It’s a favorite spot of local kayakers now, but for centuries, people have found this area to be a haven—from the seasonal stays of Native Americans to the freedmen who flocked to Hilton Head after the Civil War. And the passionate preservation of this incredible natural hideaway is what drew us to 28 Shelter Cove. 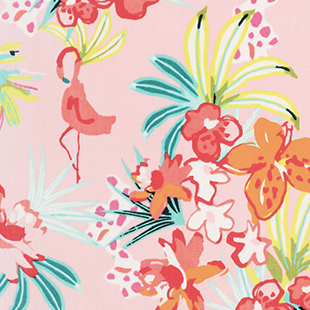 The florals in this pattern honor our native botanicals, like pink marsh flowers, jessamine and hibiscus, while the stripes resemble our shop’s shady awnings that protect our special guests. What was once referred to in the 1800s as the “Hollywood of the South” is now listed as one of America’s top 10 shopping streets. But Broughton Street in Savannah, Georgia is more than a pretty face; she’s a survivor. Named for the governor of South Carolina in 1733, Broughton Street rebuilt itself after two major fires and a bevy of economic challenges. Today, she is as beautiful as ever, which includes a certain mermaid-topped shop at number 317. 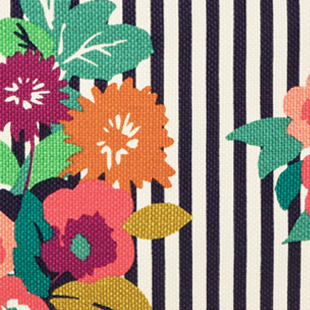 To celebrate Broughton’s ever-blooming spirit, we created this bright, bold floral pattern to remind us that beauty can grow anywhere. Built upon the high ground where cool May River breezes drift up to shady front porches, Bluffton, South Carolina, has been comforting locals and visitors alike for over 200 years. Thanks to the steamboat landing built in the 1850s at the end of Calhoun Street, this home-away-from-home became a welcomed stopover for travelers between Savannah and Beaufort. And some of us found it so nice that we made it our home. Today, our flagship store at No. 32 Calhoun is just as sweet as our bakery neighbors in The Cottage next door. That Southern sugar along with the charming azaleas growing alongside our white-spindled porch inspired this cheerful pattern of endless geometric blooms. In a seaside cottage nestled on Daufuskie Island, Spartina’s founder, Kay Stanley, had an idea. 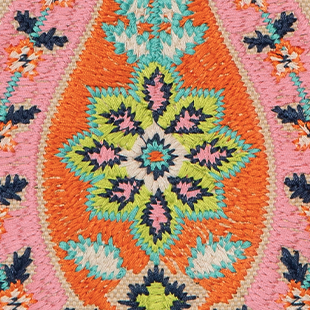 Inspired by this small, bridgeless island’s unique character and natural beauty, she imagined how linen and leather could marry with colorful patterns and timeless island stories. That thought—born at her home, 449 Lighthouse Lane, a Southern classic waterfront sanctuary, adjacent to the picturesque Haig Point lighthouse—became the beloved company we now know as Spartina 449. To mark that moment where it all began, we created a spartina-grass botanical design against a duo of maritime blues in waves that represent the sea meeting shore. It’s everything she saw from her porch beautifully reimagined in our 449 Lighthouse pattern. Left to manage her father’s plantations near Beaufort in 1738, Eliza Lucas Pinckney put her love of botany to work in order to save the family farm. Wise enough to see that the rising market for textiles also created a need for dyes, she cultivated high-grade, high-demand indigo, which ignited the historic “Indigo Bonanza” for the Carolina economy. 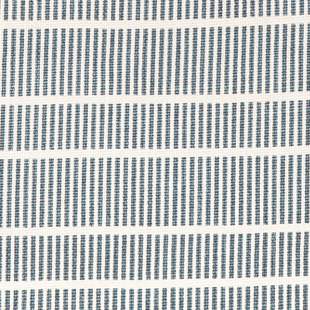 Her true blue determination—and feminine know-how—runs through our Eliza houndstooth pattern. Classic checks line up like perfectly planted row crops, but trailblazing indigo paths make their mark on this traditional hunting pattern. It’s our way of honoring Eliza’s herstory in history. Ever ponder where Rhett Butler got his name? Look to Thomas Rhett and his Beaufort plantation, which served as the family summer home in 1820, a hospital during the Civil War and now a luxurious Southern inn. This antebellum mansion is everything you want the Old South to be: a two-story, wraparound veranda, a crackling fireplace in the parlor and pecan pancakes for breakfast. Stately in both style and culture, our Rhett pattern emulates this impeccable architecture that has stood the test of time. Thoughtfully appointed, its contrasting geometric cadence pays homage to the Rhett House Inn: white Greek columns flanking gib doors that open wide to welcome Southern breezes and visitors like you. In 1853, when the heat & mosquito swarms made life unbearable each summer, Edgar Fripp and his family headed to Tidalholm, their breezy, Beaufort waterfront retreat. Most recently known as The Big Chill house thanks to the film, it’s easy to see the Southern comfort this landmark home represents. Its two-story, wrap-around columned porches extend graciously, like open arms greeting the river’s lush marsh. That Southern greeting is what you’ll find in our Tidalholm design. Emulating the porch balusters, this rhythmic blue pattern calms the eye like the sway of the tide and beckons you to stay a while, perhaps even chill. In the early 1800s, John Mark Verdier was a fine merchant. But when he became the planter & purveyor of profitable indigo and sea island cotton, well, that’s when he moved on up, as they say, building a Federal-style mansion to signify his new success (now on the National Register of Historic Places). Inspired by his fruitful story, we designed Verdier, a bold floral pattern that pulls in the blush pink and warm chestnut hues originally painted on the home. A pop of haute pink marks the next era of Verdier style and success. During the American Revolution, when the struggle was really real, loyalists nicknamed Daufuskie Island “Little Bermuda” because, like Bermuda, it served as their refuge. We, too, believe in this little island's refuge. We see its lush palmetto and oak forests, secluded beaches and quiet shores blooming with life, wild and free. 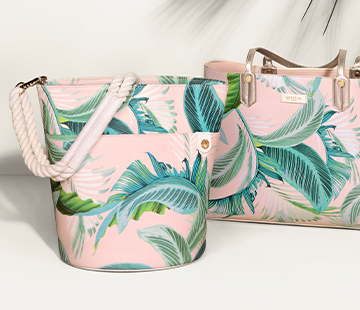 That's why our Little Bermuda pattern is loaded with brilliant florals that remind us of Daufuskie's native pink verbena and wild evening primrose. If you lived around Daufuskie in the 1870s, you knew a thing or two about a good party. Boarding a steamboat in your finest regalia, you were likely headed to the annual Moonlight Picnic, where you'd dance on the beach under the light of the full moon. 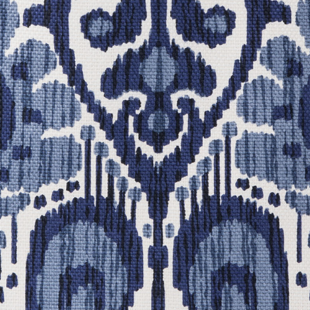 We captured that moonlit jubilance in our Moonglade pattern, our take on a tide-inspired ikat print. Each beautiful, blue, symmetrical shape vibrates with enthusiasm against a bright, ivory, which reminds us of a pitch perfect night when the moon is full and the tide is high. As dawn peeks above the horizon, locals observe the tide’s twice daily journey to and from the deep blue sea. In this golden hour, early-bird fishermen and all-night mermaids are privy to the soft glow across a pink sky as the last of night floats away. We adore this magical time each day when the sun & moon, land & sea twirl each other around. 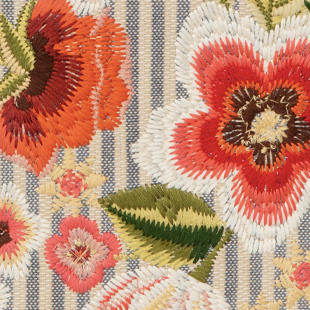 You'll see that inspiration in our High Ebb pattern: dancing florals and paisleys brimming with warm hues and laced with abiding navy accents for a look that's vibrantly sophisticated. The sea was just as important as the land to historic Daufuskie Island natives. Precious waterways provided transport for trade, protection from adversaries, and life-sustaining nourishment for generations. Today, we’re still grateful for the Atlantic waves that rock us gently to and fro. Inspired by coastal living, our Maritime pattern is beautifully designed with rhythmic, geometric shapes that honor those early navigators who mastered water, wind, sea and sail. Before our lighthouses were built to guide ships to the Savannah River, when Daufuskie’s waterway was active with night-sailing vessels, sailors reported seeing a golden, underwater light in the shape of a maiden, Cora. Playful enough to attract even the most stubborn sailors and wise enough to know the way, Cora sightings would occur most often when the waters were full of boats, suggesting that she loved visitors! Like our legendary, local mermaid, our inspired Cora pattern is full of hypnotic shapes and lines that lead you around one design to the next. Listen closely as you pass by Loreley Rock in Germany’s Rhine River, and you might hear the legendary echo of a sister siren from long ago. As the poem goes, perched high upon this steep rock, the stunning river maiden, Lorelei sings of her lost love as she combs her golden tresses. So enchanting is her beauty and hypnotic her song that she unwittingly lures sailors toward her, causing many a wreckage upon the rock. Some feared her power, but to us, Lorelei’s power is courage — to truly love another and to be herself, letting others hear her song and see her shine. Our slate-colored, herringbone Lorelei pattern has a beautiful, hypnotic rhythm to its design, likely to lure compliments everywhere you go! 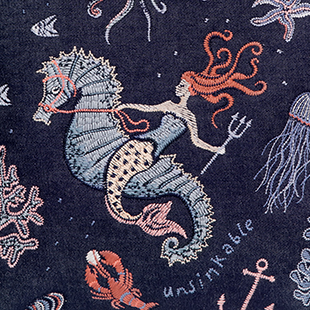 Inspired by the twists and turns of the most beloved mermaid tale ever written, our embroidered, Mareena pattern celebrates A Little Mermaid by Hans Christian Anderson. With a flip of her tail, Mareena criss-crosses the deep blue sea and royal sands for true love. Curious, passionate and undeterred, she goes after what she wants and is rewarded for her altruistic heart. The golden threads of our Mareena pattern are a small reminder that you may have a heart of gold, too. Ebb & flow. Ups & downs. The mother-ocean goddess Yemaya endures it all. Said to have ruled the most powerful waterway in Nigeria, Yemaya sailed with Africans brought to the New World to watch over them as they endured the perilous journey. Comforting and compassionate, Yemaya’s energy flows through seashells, and folklore says she gave shells to humans so they could hear her voice just as a mother would. To honor this mothering mermaid, we offer our Yemaya pattern: a blooming bouquet of abundant florals and flourishes. Drawn to Tybee Island originally in search of the “miraculous” aromatic sassafras root, the French brought influence to our shore that’s still alive today. Tybee’s eclectic personality, a passion for the arts, its bohemian beach culture and an abiding appreciation for every day beauty undoubtedly embrace joie de vivre! With a nod to classic, block-print French textiles, our Bohème paisley pattern pairs open water blues with spicy, root-inspired hues, giving this design a lovely je ne sais quo. Quietly rowing in dugout canoes through Georgia’s waterways, the Euchee tribe hunted and camped the coastal islands for hundreds of years. In fact, these Native Americans discovered and gave our beloved Tybee its name, which means “salt.” Inspired by the twists and turns of the saltwater marshes, we imparted colorful flavor into our Salt Meadow design of sprouting petals and curling paisleys. 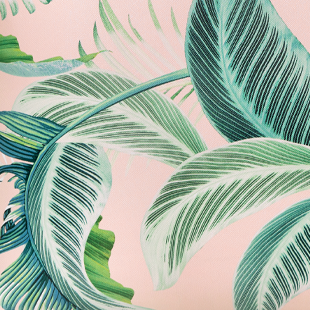 A lush and lavish print full of surprises! At the turn of the century, if you were looking for Southern revelry (or just a rest in the shade), the Tybrisa Pier & Pavillion was the place to be. Built in 1891 by the Central of Georgia Railroad, it quickly became a popular attraction with its open, breezy dance floor set against the Atlantic Ocean’s beachy backdrop. Today, it’s still the best spot for watching the sun slip beyond the sea. 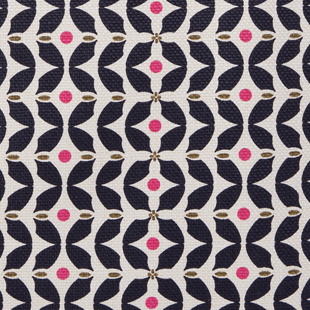 We like to think that the past and present are always crossing paths, much like our Tybrisa pattern. Interlocking ovals link arm-in-arm atop a sea-faring navy blue for a look that stands the test of time. If it weren’t for the De Renne family, early Georgian history would be lost to the echoes of time. From their ancestral roots at Wormsloe to housing the family’s manuscript collection in the University of Georgia Library, three generations of De Rennes diligently collected and published nearly 15,000 primary works that chronicled colonial and state history. Such commitment does not go unnoticed. That’s why we designed our library-inspired, De Renne pattern to represent the twists, turns, ups and downs history weaves, reminding us that all roads lead home. As the guiding light of the Poetry Society of Georgia, Elfrida De Renne Barrow welcomed quality over quantity with her own beautifully notable poems. As a historian and founder of the Wormsloe Foundation, she championed her family’s tradition of publishing new, historical works through the University of Georgia Press. For these efforts, Elfrida earned her posthumous place among the Georgia Women of Achievement. Today, we are humbled to honor her generous nature and her zeal for preservation with our Elfrida pattern, blooming with historic hues and classic botanicals. Early days at Wormsloe Plantation were ripe with agricultural endeavors: cotton, grains, vegetables, fruits and a curious grove of mulberry trees. Planted not for fruit but for leaves, the mulberry grove was sown with high hopes of nourishing a successful silkworm venture. 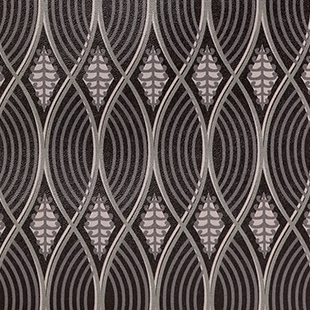 Those uniquely designed leaves inspired our Mulberry Grove pattern. Ever burgeoning with lobed leaflets and prodigious branches, each sophisticated flourish is a nod to this historic orchard. Now a cozy and beloved bakery and café, The Cottage on eclectic Calhoun Street has been welcoming people home since distinguished soldier J.J. Carson built it in 1868. So welcoming was the cottage that its front room became the inaugural home of Bluffton’s First Baptist Church in 1902. Today, the front porch invites colorful locals and visitors alike to sit for a spell amidst garden flowers to enjoy a cup of afternoon tea. 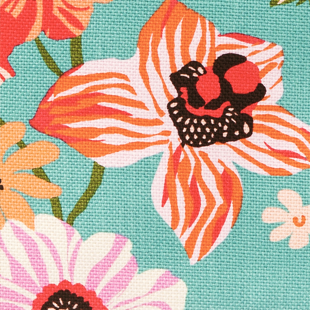 Inspired by The Cottage’s charming Southern porch, we designed a vibrant floral pattern that is as welcoming as a freshly made scone. 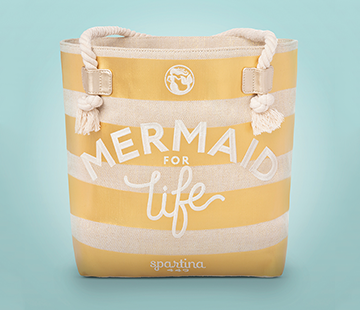 Stop by and say "hello" and then wander next door to our Spartina Flagship store. The name Heyward is synonymous with Old Town Bluffton, SC, thanks to two iconic homes. The Cole-Heyward House serves as the official Welcome Center and Town Museum. Built in 1841 by John J. Cole for his young bride to escape the inland summers, this antebellum home has been beloved and preserved for 170 years. The second home is the D. Hassell Heyward House, a classic Southern abode with a wide, winning front porch that is so welcoming that we made it our Flagship Store! With a lineage that includes a signer of the Declaration of Independence, “The South’s greatest rice planter,” a governor of South Carolina, and the playwright who penned “Porgy & Bess,” the Heyward name is an institution in these parts. 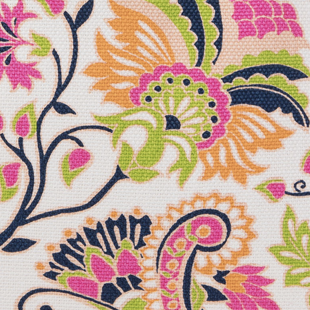 The Heyward pattern feels just as classic, yet fresh and inviting. The balmy lime hue greets a lovely lattice, delightfully suggesting that our screen doors, are always open. Cool and constant, the May River is a natural treasure for Bluffton locals and visitors alike. The bluffs overlooking the May River are what gave charming Bluffton its name. One of the oldest spots along the waterway is the popular Bluffton Oyster Company, known for their fresh oysters and other fine seafood. The company, like any good Southerner, keeps tradition, which is why all their prized oysters are still harvested and shucked by hand. The building itself sits upon more than a hundred years of shucked shells! 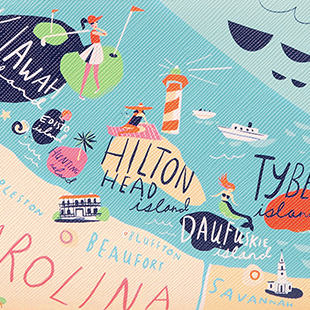 Our May River pattern celebrates these pillars of local pride. A deep navy hue sets off an alabaster chain pattern, giving a nod to both stream and shell in Bluffton’s treasured riverside culture. Simple and stately, Seven Oaks is a Bluffton treasure. Built in 1850, this cotton-white, two-story manor features double verandas and two, steeple-like chimneys. Today, it’s the rectory for the iconic, historic Church of the Cross. It’s an unmistakable Southern belle. And the name? Seven Oaks is derived from the seven, immense, oak stumps that were built into the structure of the house and still support it today. Paying homage to the beautiful, contrasting exterior of Seven Oaks, we paired an elegant ivory background with distinctive black linear pattern to represent the dual features of the home. This classic combination is destined to be as timeless as Seven Oaks itself. Born and raised in one of Savannah's most influential families, Juliette Gordon Low possessed a well-rounded education and a wonderful sense of humor. Though her marriage took her to live in England, she returned to Savannah and to her home near Wright Square after her husband's passing to begin her life's work: founder of the Girl Scouts of the USA. In admiration of Mrs. Low's fortitude, her character and her celebration of girlhood, we dedicate our Juliette pattern, an iconic paisley bursting with intricate details in scouting-inspired blues and greens. More than anything, Mary Telfair had a deep and passionate appreciation for the visual arts. As a member of the distinguished Georgian Telfair family, her abiding love for art, which was displayed in her magnificent Regency-style home, was bequeathed to the Georgia Historical Society, making her home the first and now oldest art museum in the South. You can tour it today just off Savannah's Telfair Square. 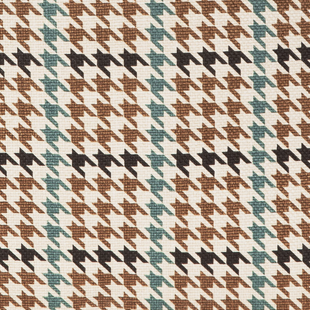 We honor Mary's reverence for beauty and truth with our own tried-and-true, Telfair pattern, a camel-backed plaid whose lines intersect with strength and sincerity. Savannah's Ellis Square is testament to perseverance, not merely for its first 200 years as a bustling marketplace, but rather for its heroic restoration from becoming a parking lot in 1954. The bleak parking lot, however, gave rise to the Savannah preservation movement, which brought Ellis Square back to its rightful beauty in 2010, crowned by a bronze statue of native son and famous songwriter Johnny Mercer. Recalling dapper, crosshatch, menswear patterns and Savannah's cobblestone streets, we created the Ellis Square pattern to use both positive and negative space in its design. 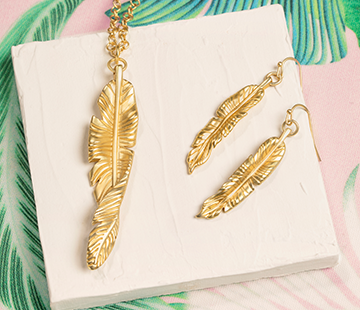 This elegant look is destined to be a favorite, as Mercer would say, come rain or come shine. Just off of Madison Square is “one of the finest examples of Gothic Revival architecture to be found in the South,” the Green-Meldrim House. During the Civil War, this house was also where General Sherman was presented with the key to the city, a measure that ended up saving the city’s beauty and, in turn, was given to President Lincoln as a Christmas present. Around this landmark home, you’ll find ornate ironwork wrapping the porch, thus, the inspiration for our Madison pattern—a contrasting weave of vanilla and chocolate with a refreshing pop of teal. Tee up your style with the smart, tailored look of our Hilton Head pattern. Known for its miles of pristine beaches and world-class golf courses, Hilton Head Island’s seaside retreats draw visitors from all over the globe to play where the pros play. In fact, the Heritage Golf Tournament was first played in Sea Pines in 1969, and has been a regular stop on the PGA TOUR ever since. Inspired by the island’s famous links and its iconic lighthouse, our Hilton Head pattern evokes the dimpled charm of the quintessential golf ball paired with a nautical nod to the Harbour Town Yacht Basin. Get a jetsetter’s style with just one visit to this picture-perfect sea island. With over 400 years of history under eight different flags, Amelia Island in Naussau County, Florida is a historical place that “the French visited, the Spanish developed, the English named, and the Americans tamed.” The influence of those flags is still felt today, whether in the flair of Fernandina Beach or in this fanciful Spartina pattern that can take you from Amelia to anywhere in a flash. As the largest of Georgia’s coastal Golden Isles, St. Simons Island is nestled with some of the country’s most elite resorts, and it’s easy to see why. Unspoiled beauty like mossdraped oaks and glistening sunset beaches have attracted upscale pleasure-seekers for decades. From the dreamy beginnings of the original lighthouse to the grand Strachan mansion, which relocated 100 miles to Daufuskie in 1986, there are plenty of reasons to fall in love with this sea island. In honor of this golden getaway, you’ll find romantic Baroque paisleys and flaxen flourishes like graceful sea oats, motifs fit for a queen. With it’s sun-drenched beaches and its even sunnier disposition, Tybee Island is a charming oasis. As “Savannah’s Beach,” this barrier island off the coast of Georgia is a beacon for beachgoers—be it sea turtles or artisans, townies or tourists. It’s also home to one of the last 18th-century beacons still in operation: the Tybee Island Light Station. Inspired by this island’s colorful cottages and natural radiance, our Tybee print spotlights coastal hues in a brilliant sunburst design. Stunning scenic views, five championship golf courses, pristine sandy beaches, lush foliage everywhere you look—this is living the good life. From Kiawah Island’s grand resorts to its private wildlife sanctuaries, there is an air of elegance in every experience, which is as black tie as island life gets. This posh allure is represented in our Kiawah pattern: classic contrast, sophisticated lines and a stately design that transcends the test of time. John Stoddard’s life with Mary Lavinia played out like a Jane Austen novel. He was a Bostonian mercantile businessman living in Paris and in charge of the Parisian import house, Stoddard & Lovering. She was of French descent and the heiress to an extensive tract of land on Daufuskie primed for growing “Sea Island cotton." Fate brought the two together. In 1836, John left his career to marry his Lowcountry princess and the two settled on Daufuskie, naming Melrose Mansion after their romantic destination honeymoon in Melrose, Scotland. 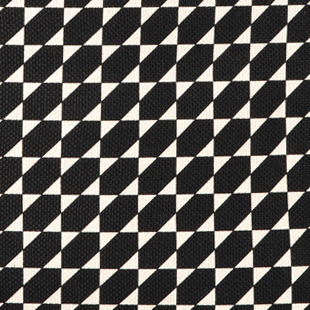 The houndstooth pattern originates from the woven wool cloth of the lowlands of Scotland and this design reminds us chivalry is not lost. 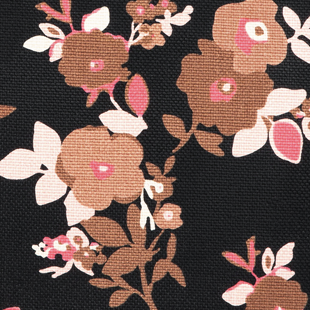 Like a beautiful French floral, Mary Lavinia evoked refinement, elegance and femininity. Her Daufuskie home, Melrose Mansion, bloomed with a formal garden said to have been filled with roses and renowned by garden enthusiasts across the Lowcountry. 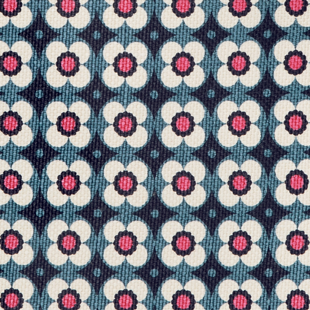 Perhaps, this peony and rose pattern was on the curtains of her honeymoon suite, or strewn across her living room settee, or a pattern on her afternoon tea dress. Our minds can only imagine Mary Lavinia’s life as the interplay of camel, coral, dark navy and poppy give depth to this regal, yet ladylike fabric. Everyone wanted the same thing— to reign supreme. The English were colonizing in the Lowcountry, chartering new terrain and industries. As a result, the equally eminent Spanish grew increasingly uncomfortable with the English settling so close to their Floridian territories. Wanting to protect their interests, the Spanish persuaded native Daufuskie Indians like the Yemassee tribe to defend their Island home against the invasion by newcomers. The intersecting of these fates is relayed in this pattern by the power play of lines—both tribal and refined—in an effort to commemorate the fierce battles at Bloody Point Beach on Daufuskie Island and the honorable sacrifices of those who fought with their hearts and hands from 1715 to 1717. French explorers off the South Carolina coast navigated through life and the back creeks, rivers and estuaries of the Lowcountry on flat-bottomed boats called “bateaus." As time passed, these boats cruised into a different purpose. Salty crew members fished and harvested oysters from them and the Gullah population continues to draw inspiration from them, singing folk songs like “Michael Row the Boat Ashore"—a spiritual song written by former slaves. More similar than they will ever know, the European explorers, the local fishermen and the Gullah natives all embarked on a journey to provide for their families and establish a maritime community. 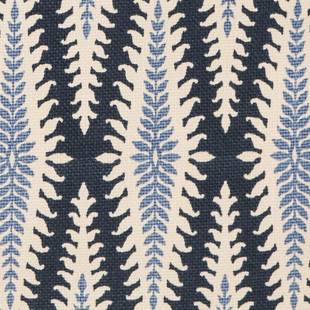 In tribute to these kings of the water, this pattern combines their intricate connection with the sea and the land with the geometric interplay of two blue tones—one coastal, the other nautical—and a camel color reminiscent of Daufuskie’s sandy shores. Ceremonious receptions for officers and those offering respect to a ship and its captain occur on the most revered area of a sailboat, the Quarterdeck. Marked off by decorative lines and classic knotting, the Quarterdeck is traditionally known as the raised deck behind the main mast of a tall ship where the colors are also stored. Today, flags are often used to decorate maritime establishments on land to resemble the shipboard quarterdecks. The Quarterdeck pattern represents esteemed nautical designation and seafaring tradition. The historic Strachan Mansion welcomes visitors to Haig Point Club as they arrive to Daufuskie Island by ferry. Unlike any other structure on the island, the 7,500 square foot manor was shipped on two barges from St. Simon’s Island to Daufuskie in 1986. The 1910 Victorian home was originally built by Savannah shipping magnate, J.S. Strachan as a family beach house in South Georgia. Prestwick Green, an enclave of coastal cottages located at Haig Point on Daufuskie, is one of the most picturesque neighborhoods on the island. Situated on the Rees Jones Signature Golf Course, homes in this charming community feature inviting screened porches designed for summertime entertaining, picture windows with long views of the Calibogue Sound, and white picket fences that provide the perfect lowcountry welcome. Prestwick Green is named after one of the oldest golf courses in the world, the Prestwick Golf Club in Scotland, which is also the birthplace of the Open Championship. Florence Martus inspired thousands of international sailors as she saluted them coming and going through the Port of Savannah at the turn of the 20th century. The young lady waived a handkerchief by day and a lantern by night to every ship that passed through the Georgia seaport between the years of 1887 and 1931. According to legend, not a ship was missed in the Waving Girl’s forty-four years on watch. Romantic folklore about a lost love, flirting sailors and treasured gifts accompany the legend of the Waving Girl. A statue of Martus sculpted by Felix de Weldon was erected in the historic Savannah riverfront to commemorate her seafaring hospitality. The Waving Girl pattern celebrates her spirited welcome and warmth. Surrounded by the waters of the Calibogue Sound and the Cooper River, Haig Point is a private island oasis located on the northeast end of Daufuskie Island. Known for its casual southern living, Haig Point offers numerous outdoor activities for each member of the family. Nestled among live oaks and palmetto trees, this elegant maritime community accommodates the recreational traveler while respecting the island’s natural surroundings and rich history. The original plantation home, dismantled during the Civil War, was considered one of the largest tabby structures in the Lowcountry, and the Haig Point Lighthouse is on the National Register of Historic Places. The Haig Point pattern complements this composed harmony between man, land and sea. At a location on Daufuskie known as Rabbit Point, archeologists unearthed relics suggesting that a Yemassee Indian village may have been located there. Families lived in huts made from logs and palmetto thatched roofs and traveled by horseback and canoe. Basket weaving, woodcarving, and pottery were common art forms. Today, lucky Daufuskie Islanders often find pottery shards dating back thousands of years, and it’s not uncommon for long-time residents to have baskets filled to the brim with these historical relics. After the Civil War, times were tough on coastal islands. Plantations were in financial ruin, freed slaves often had no place to live and little to eat, and jobs were scarce. However, hope came to Daufuskie in 1910, when a company started a lumber mill on the island and provided jobs for hundreds of men. As part of their operation, the company set up a railroad including a coal burning train that carried cut timber from one end of Daufuskie to the other. At water’s edge, the logs were flipped into the water at high tide, and then wired together into a raft with a wire cable. After a number of rafts were made, they were joined, tied behind a tugboat, and carried to Savannah. Branches of the railroad tracks were laid across the property of island residents. One of the branches ended in a switchyard on the land owned by Pender Hamilton. The oyster industry provided work for Daufuskie Islanders from the 1880s to 1959. The oysters around the island and neighboring islands were plentiful, lush, and according to historian Billie Burn, “the tastiest on the east coast.” So tasty in fact, that Daufuskie oysters were shipped all over the world. This included delivery to the Tsar of Russia who took delight in this “exotic” food. The man who first brought a full-scaled oyster industry to Daufuskie was Luigi Paoli Maggioni, originally from Genoa, Italy. In 1893 he opened an oyster-canning factory on the island and Daufuski Oysters (minus the “e”) became the Maggioni brand name. The red labels on the can feature the trademark of an Indian Head adorned with a beautiful, feathered war bonnet. The Maggioni Oyster Company continues to operate from Savannah, and Daufuski canned oysters may be found on shelves today, but they do not contain oysters from Daufuskie. The oyster economy ended on Daufuskie when polluted waters from the Savannah River contaminated the oyster beds. One of the earliest leases for oyster farming on Daufuskie was issued to Captain James P. Chaplin in 1896. In addition to maintaining an oyster shucking plant, Chaplin had a commissary store where he sold goods to islanders that were issued against credits. The store was not as successful a business venture as oystering because when a customer didn’t have credits to draw against, Chaplin let them have the goods anyway. In a memoir recorded in Billie Burns book, An Island Named Daufuskie, Chaplin’s grandson writes: “I am convinced that my Grandfather Chaplin was a very rich man, not in worldly goods, but in the ways that count. He gave to the hungry, and in turn, he himself was fed by their love and respect.” The Chaplin’s two-story home eventually became the home of the Oyster Society Hall. In recent years, the building was restored by the Daufuskie Island Historical Foundation and is open to visitors. Daufuskie Island, South Carolina continues to be the inspiration for Spartina 449. Harbour Town, situated near the southern tip of Hilton Head Island, is a favorite stop for Daufuskie Islanders. Located only fifteen minutes away from Daufuskie by boat, Harbour Town is famous for its elegant harbors, intimate shopping plazas, great restaurants, and picturesque marinas. A visitor can discover a surprise around every bend at Harbour Town, including summertime sing-alongs beneath a giant oak tree. Harbour Town Light, a red and white striped lighthouse located at the Harbour Town Marina, is a widely recognized symbol for Hilton Head Island, and a landmark for locals. It’s also familiar to millions of golf fans who watch an annually televised golf tournament held at Harbour Town Golf Links. The 18th hole, which ends near the Harbour Town Light, has become one of the most popular and recognizable finishing holes in golf. Sophistiaction meets preppy with sunny yellow, cream and a burst of burnt orange, creating a modern geometric pattern. Shimmery metallic leather completes this yacht club favorite. A geometric lattice blooming with bright orange, light pink, yellow and poppy red creates a casual summer style with a touch of rustic charm. Long, open porches called verandas are a common denominator of many southern homes, and are often a symbol of good fortune and gracious living. If you’re sitting on one of the many verandas on Daufuskie Island, you’re likely to be offered a glass of sweet tea as you enjoy the sounds and sights of island living. If you’re lucky, you’ll be witness to nature’s serendipity, where you might be surprised by a beautiful orange sunset, the brown eyes of grazing deer, or an up-close view of a Painted Bunting, one of the island’s most colorful birds. If the veranda overlooks the water, you might catch the antics of playful dolphins in the ocean, or get a glimpse of great white egrets tending their nests in a nearby rookery. Verandas are also the locations of impromptu gatherings, surprise celebrations, and pleasant conversations with friends and neighbors. Overall, a veranda is a perfect spot for serendipitous happenings! Crisp, white geometric on a gray background, paired with orange accents and citrine leather for a classy, casual style. That's a tasteful choice for any occasion. A walk on Daufuskie beaches offers many serendipitous surprises including occasional encounters with fascinating fiddler crabs. Abundant in South Carolina, fiddlers are found on the beach and also along brackish inter-tidal mud flats including swamps and lagoons. The term “fiddler” refers to one huge front claw the male hefts up in the air like a violin. The opposite claw is smaller and resembles the bow. Males use their “fiddlers” to spoon up food, as a weapon to defend their burrows against intruders, and, at mating season in spring and summer, to attract the females to their burrows. At low tide, when fiddlers are active, it’s quite a show to come upon thousands of gyrating males pumping and waving their claws to fetch a girl! When the female is ready to mate, she wanders through the waving males and visits up to 24 burrows before making a selection. Mating occurs in the lucky bachelor’s burrow, and two weeks later the female releases her eggs into the high spring tide. 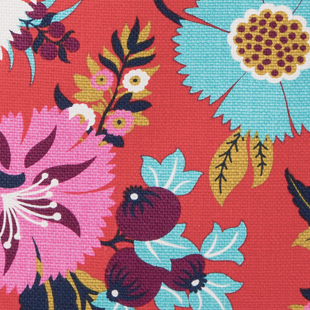 Modern floral patterns combine golden yellow, citrine green and turquoise on a vibrant red background to capture the season's colorful style. The Martinagele family, one of the first permanent families on Daufuskie Island, originally came to the United States from Italy to flee religious persecution. Records show that in 1762, Mary Foster Martinangele, widow of Phillip Martinangele, purchased 500 acres of land of Daufuskie and built a mansion on Mongin Creek on the south side of the island. In 1785, she gave 100 acres of land each to five of her eight children (three had presumably died). As the property was divided, the 500-acre tract was known at various times as Eigelberger, Twins Point, and Mary Dunn Plantation. Most of the plantation land eventually passed hands with the exception of 4.6 acres known as the Mary (Martinangele) Dunn Cemetery which is owned today by descendants of the Martinangele family. Several hundred acres of the Eigelberger tract remain undeveloped, and in a recent serendipitous event, a local family purchased a large portion of the property to use as their vacation retreat. This was a welcome surprise for Daufuskie residents who value the natural beauty of the island and work to protect its pristine environment. 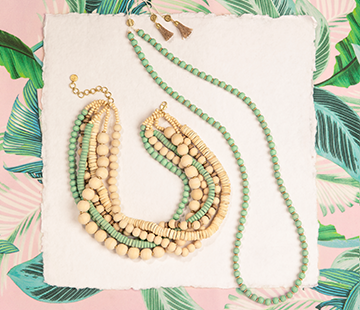 Gorgeous green, the color of the season, is artfully combined with graceful cream and navy leather accents for a look that's fresh and fashionable. Patti Callahan Henry loves to walk the low tide beach at the southern point of Daufuskie where “it looks as if you can walk to Savannah.” A southern novelist and New York Times bestselling author, Patti discovered Daufuskie after her boyfriend (now husband) brought her to the island to show her the lot his parents had purchased. From that day on, she loved Daufuskie as her own. Engaged at the Haig Point Lighthouse, she and husband Pat currently live in Atlanta, and have been coming to Daufuskie four or five times a year for the past twenty-five years. The landscape and ancient stories of the island have been a continuous source of inspiration for Patti’s novels, many of which describe or are partially set on Daufuskie. Her first book, Losing the Moon, describes an island just like Daufuskie, and for almost all her other stories, she confesses to “borrowing and stealing Daufuskie names, beaches, and landmarks.” From a favorite Daufuskie restaurant called, Marshside Mama’s to depictions of colorful island characters, her stories capture the essence of life in the lowcountry. A burst of red on a traditional black and cream pattern creates sophisticated style with the perfect amount of “kick.” Black leather accents and a red linen interior complete this must-have look that leads this season’s fashion trends. As a Daufuskie Island resident, there was nothing Billie Burn couldn't do. When the church needed a pianist, she taught herself to play the piano, and when the Community Club needed a Secretary she was appointed to a volunteer job that lasted 23 years! In the meantime “Ms. Billie” was also the postmaster, school bus driver, registrar, and restaurant owner, serving food seven days a week from her home at Jolly Shores. In her adventures as a bus driver, Ms. Billie picked up “everybody and everything from snap beans to deer meat.” As she began listening to the entertaining tales of her passengers, she eventually had an idea to “get a history.” Twenty years later, after accumulating stories and supplementing them with her own extensive research, Billie began assembling a book that would become a 592 page permanent record of the island’s history. Although Ms. Billie passed away in 2008, An Island Named Daufuskie sits on a prominent shelf in most Daufuskie Islanders’ homes. The book serves as a reminder of Billie Burn’s immense creativity and legendary legacy of kindness, commitment, and community service. Intriguing motifs in luscious shades of gray and cream combine with luxurious tan-colored leather accents to create a design that is as fetching as it is fashionable. 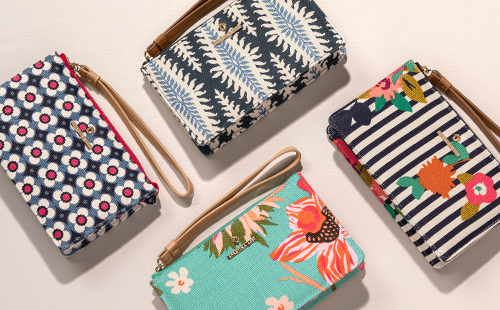 Orange, the color of creativity, becomes the picture of style when combined with cream colored patterns inspired by Spartina’s signature logo. Leather accents in reddish-brown and navy compliment this captivating design. Sally Lesesne is an artist whose favorite place on Daufuskie is the marsh, and lucky for her, she has a magnificent view from her bedroom. With a cup of morning tea, she props herself up against the bed pillows and looks out across the water to Savannah. “In the winter,” she says, “a small flock of hooded mergansers swim and fish where a little creek comes out of the salt marsh. I have a pair of binoculars hanging on the bedpost, and there’s nothing I love more than watching the tremendous variety of wildlife that passes by.” Sally also loves anything botanical in nature, and when she moved to Daufuskie twenty years ago, she painted mostly flora and fauna. Today her preferred subjects are island inhabitants, especially children, and she has a knack for capturing their essence in her acclaimed artwork. Sally lives in an original Gullah residence situated on the New River. A visitor viewing the collection of paintings in her home would easily identify other recurring themes in her work including colorful recordings of Daufuskie celebrations as well as paintings that capture scenes from her travels abroad, and others that pay tribute to her love of baking. The Lesesne pattern with its distinctive magenta blossom is particularly fitting for Sally whose Grandmother “Rose” was from historic Roseland Planation, located a short distance from Daufuskie near Port Royal Sound. It took a horse to convince Christina Bates to move from Hilton Head Island to Daufuskie. Even though she had fallen in love and married a Daufuskie Island shrimper, she continued to commute to Daufuskie in a 14-foot boat. When her husband bought her a horse and towed it to Daufuskie behind his shrimpboat, Christina was finally convinced to make the move. Eighteen years later she and her husband had raised two boys, and Christina had become one of the island’s most celebrated artists. “Daufuskie was and is a wealth of inspiration. I had the rare opportunity to live in a community from days gone by; people traveled in ox-carts, lived off the land and water, bartered for goods, and everyone lived harmoniously.” While she was on Daufuskie, Christina was mostly known for her hand-painted etchings of landmarks and representations of the native Gullah lifestyle. Today, she continues to do etchings, but has expanded her work to include her love of horses and hounds, which she paints in oils. Daufuskie’s population swells in the summer as part-timers move into their island homes. Before the advent of air conditioning, people moved to the shore in the hot months to escape the heat. Today, they enjoy cool island breezes from gracious front porches. From their homes, some can hear the sounds of the ocean and even, perhaps, the alluring call of the mermaid’s song. Calibogue Sound, an Indian name meaning “Sweet Water,” borders Daufuskie Island on the east. The island is bordered on the north by the Cooper River, the south by Mongin Creek, and by New River on the west. According to local mermaid mythology, sailors who passed through the area on ships at night were often lured into the waters by the captivating songs of beautiful mermaids. Once in the water, the mermaids disappeared. Daufuskie’s beaches are a favorite for sun-seekers and shell collectors. Depending on the time of year, treasure hunters can find conch shells, starfish, sand dollars, horseshoe crabs, and other fascinating sea creatures. According to local legend, you might even find mermaids sunning themselves in the light of the moon. Mermaids have captured the imaginations of people around the world, and every country has its own mythology surrounding this intriguing aquatic creature. In the southern European country of Maltese, for example, sirens and mermaids have the same description and are known as Sirena. Common characteristics of all mermaids are their beguiling beauty, mesmerizing melodies, and feminine charm. 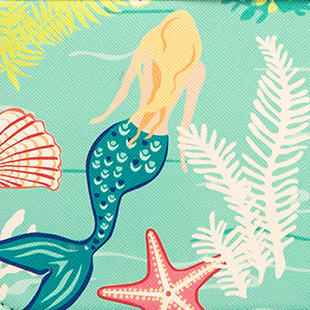 So, keep your eyes open…you never know when an enchanting mermaid might captivate you! Sailboats are a common sight around Daufuskie as sea-going adventurers are enticed by some of the best harbors and surrounding waters for yearround sailing. Average air temperatures range from 59˚ in January to 89˚ in July with ocean temperatures averaging between 52˚ and 84˚. Mariners navigating the waters have to be aware of winds, tides, and of course, mermaids! Children and adults alike are charmed and delighted by the congregation of critters at the Daufuskie Island Farm. Home to over 200 animals including chickens, pigs, cows, bees, and calves like Gracie, island residents pitch in to feed the animals, gather eggs, collect milk, water the community gardens, and do whatever it takes to maintain and grow the island’s first sustainable farm. Maggie, a legendary Daufuskie spirit, was the daughter of the first keeper of the Haig Point lighthouse. She fell in love with a tradesman hired to do restoration work on the 1873 structure, and when he never returned, Maggie was heartbroken. Some claim the figure that is sometimes seen in the lighthouse tower window at night is Maggie, still waiting. Sarah Grant, the last midwife on the island, was married to undertaker, Joe Grant. When Joe passed away and Sarah took over his job, an islander was said to remark: “Granny bring ‘em ‘n she take ‘em away.” Sarah’s charming historical home has recently been restored by a private owner. Charming plates, platters, pots and other unusual pieces at the Silver Dew Pottery include designs inspired by thousand year old Indian pottery found on the island. Potters Emily and Lancy Burn are long-time island residents who treat visitors at their quaint shop to a peek at their impressive collection of island artifacts, and to fascinating stories about island living. Magnificent flower gardens that surrounded the Melrose Plantation (circa 1890) on Daufuskie included acres of roses and a variety of fragrant blooming flowers, including, the colorful and beloved southern shrub, the Camellia. Anchored by rich brown leather accents, citrus greens mix with magenta, ivory and pink. The Isabelle was a 65 foot work boat captained by George Conner. The boat had two decks and ran between Daufuskie Island and Bluffton, SC around 1929. Black leather highlights a vibrant pattern that weaves together brilliant greens, deep violets and boisterous blues. Antiques abound on Daufuskie as Islanders collect shards of colorful china and vintage glass left from the days of the grand plantations. Lucky collectors are also able to find civil war relics and pottery pieces from ancient Indian settlements. Ivory leather peeks over a memorable combination of vintage pink, sweet orange, and gracious green. "Island Girl" was the name of a 58 ton motor-powered ferry boat that shuttled passengers and workers between Savannah, Georgia and Hutchinson Island from 1924 to 1954. As of today, no regular ferry service is available from Daufuskie to Savannah. Islanders who make the trip either take their own boats or take the ferry from Daufuskie to Hilton Head, and then drive one hour south to Savannah. Sand colored leather frames a forest of rich aqua, lush lavender, and sparkling shades of bright green. The Mt. Carmel Baptist Church No. 2 is home to Daufuskie Island’s Billie Burn Museum, named after the island’s long-time resident and island historian, Billie Burn. The museum contains wonderful artifacts donated by the Burn family and other Daufuksie Islanders and also includes a summary of the island’s rich history. Buttery caramel and luscious ivory swirls marry rich brown leather to create a delicious anytime treat. Oakley Hall (circa 1874) was a wooden, two-story mansion located at the Bloody Point Plantation on Daufuskie. Presumably named for the live oaks that were used to build the house, the classic mansion was put together with oak pegs. Due to a state of disrepair, Oakley Hall was torn down between 1937 and 1939. An elegant and stylistic black fleur-de-lis resting on a tan background combines with black leather accents to create a partnership that is sophisticated and timeless. Tides on Daufuskie drift in and out like clockwork. Known as the heartbeat of nature, high tides occur every 12 hours and 24 minutes; low tides every 6 hours and 12 minutes in between. Caused by the pull of gravity from the sun and moon upon the Earth’s waters, islanders follow the tides to find the best time for shelling, boating, fishing, and even planting. The fiery orange of the rising and setting sun and the brilliant glow of the golden moon provide a daily dazzling display of light on Daufuskie. At dark, the skies explode with acres of brilliant stars, lighting the sand roads, the ancient oaks, and the ghost crabs scurrying along the night time beaches. The earth melts into the waters in the soft, salty, low-lying areas called the salt marsh. Home to the perennial grass, Spartina (the inspiration for our company name), the salt marsh is the biological breadbasket of the island. One acre of marshland is home to literally millions of fiddler crabs and a staggering population of marine life. Sea breezes toss dancing kites across the deep blue sky, fan beach front campfires, and kiss the cheeks of islanders and visitors strolling along low country coastlines. A sea breeze occurs during the day when the sun heats the land and makes the air above it hot. This air rises and pulls in cooler air from the sea to replace it. Fuskie Lane, inspired by Daufuskie’s unspoiled beaches, captures the warmth of sand on bare feet, the tickle of ocean waves on children’s toes, and the delight of found treasures after a morning of shelling. A ferry trip to the mainland delights passengers with daily surprises. 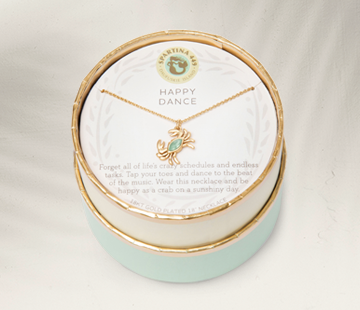 dancing dolphins, flocks of seagulls chasing dazzling shrimp boats, and lovely conversations with island neighbors are just a few of the sights and sounds that inspired the port passage collection. The sun rises over the Atlantic ocean in a giant blaze of spectacular color and kisses the island with the promise of a new day. Inspired by the beauty of our glorious waking sun, Island Kiss features the bright hues of our spectacular dawns. Water, the inspiration for the Freeport collection, is the soul of the island. Carrying journeyers to and from their homes, it nourishes with its mighty bounty, entertains with its rising and falling tides and surprises and delights with sneak peeks of the curious creatures that inhabit its depths. Sweetgrass, found sparsely in coastal sand dunes, is a sturdy grass that has been used for over 400 years in the art of basket weaving. Common in the Lowcountry, sweetgrass baskets carry the beauty of rich tradition and are the inspiration for the exciting patterns and colors of the Sweetgrass collection. The entire island of Daufuskie is on the National Historic Register and residents are working to preserve buildings such as The Oyster Society Hall. In the early 1900s workers in Daufuskie’s booming oyster business gathered here for monthly meetings. Benjie’s Point, one of Daufuskie’s most traveled sand roads, is the address of the Silver Dew Pottery, which displays the island’s largest private collection of ancient Indian pottery. Casting for shrimp is an art in the Lowcountry. During the season, fishing enthusiasts can be seen standing in boats and on docks slinging giant round nets into the water. The Daufuskie Island Art Gallery is a quaint Gullah house that displays unique and original artwork, all created by Daufuskie’s talented residents. Driftwood, which washes onto Daufuskie’s shores by winds and tides, becomes shelter for birds and plants and is often the foundation for protective sand dunes. Follow the winding beach path for up close views of brilliant marsh and dolphins playing on the ocean. Enjoying a walk along the beach, feel the salty breeze coming from the sea. Every hour a ferry arrives to Daufuskie Island bringing passengers from all over. A short stroll down the dock and they enter into a land that seems a million miles away. A sea island, accessible only by boat, Daufuskie Island is considered one of the last unspoiled American treasures... A peaceful morning ride to Daufuskie on the Haig Point ferry. Daufuskie Island, one of America's last unspoiled treasures is a sea island off the coast of South Carolina. A true Daufuskie Island landmark, the Iron Fish Art Gallery is located in a historic Gullah cottage. Chase Allen, the creator of the rustic shop, sells beautiful aquatic metal art sculptures.